Ever since Galileo Galilei first observed Jupiter closely in 1610 using a telescope of his own design, scientists and astronomers have been immensely fascinated by the Jovian planet. Not only is it the Solar System’s largest planet, but there are still things about this world – despite centuries of research and numerous exploration missions – that continue to mystify even our greatest minds. One of the main reasons for this is because Jupiter is so starkly different from what we Earth-dwellers consider to be normal. Between its incredible size, mass, composition, the mysteries of its magnetic and gravitational fields, and its impressive system of moons, its existence has shown us just how diverse planets can truly be. Earth’s has a mean radius of 6,371 km (3,958.8 mi), and a mass of 5.97 × 1024 kg, whereas Jupiter has a mean radius of 69,911 ± 6 km (43441 mi) and a mass of 1.8986×1027 kg. In short, Jupiter is almost 11 times the size of Earth, and just under 318 times as massive. However, Earth’s density is significantly higher, since it is a terrestrial planet – 5.514 g/cm3 compared to 1.326 g/cm³. Because of this, Jupiter’s “surface” gravity is significantly higher than Earth normal – i.e. 9.8 m/s² or 1 g. While, as a gas giant, Jupiter has no surface per se, astronomers believe that within Jupiter’s atmosphere where the atmospheric pressure is equal to 1 bar (which is equal to Earth’s at sea level), Jupiter experiences a gravitational force of 24.79 m/s2 (which is the equivalent of 2.528 g). Earth is a terrestrial planet, which means it is composed of silicate minerals and metal that are differentiated between a metal core and a silicate mantle and crust. The core itself is also differentiated, between an inner core and outer core (which spins in the opposite direction of Earth’s rotation). As one descends from the crust to the interior, temperatures and pressure increase. The shape of Earth approximates that of an oblate spheroid, a sphere flattened along the axis from pole to pole such that there is a bulge around the equator. This bulge results from the rotation of Earth, and causes the diameter at the equator to be 43 kilometers (27 mi) larger than the pole-to-pole diameter. In contrast, Jupiter is composed primarily of gaseous and liquid matter which is divided between a gaseous outer atmosphere and a denser interior. It’s upper atmosphere is composed of about 88–92% hydrogen and 8–12% helium by volume of gas molecules, and approx. 75% hydrogen and 24% helium by mass, with the remaining one percent consisting of other elements. The denser interior is composed of roughly 71% hydrogen, 24% helium and 5% other elements by mass. It is believed that Jupiter’s core is a dense mix of elements – a surrounding layer of liquid metallic hydrogen with some helium, and an outer layer predominantly of molecular hydrogen. The core has also been inferred as being rocky, but this remains unknown as well. And much like Earth, temperatures and pressures inside Jupiter increase dramatically toward the core. At the “surface”, the pressure and temperature are believed to be 10 bars and 340 K (67 °C, 152 °F). In the region where hydrogen becomes metallic, it is believed that temperatures reach 10,000 K (9,700 °C; 17,500 °F) and pressures 200 GPa. The temperature at the core boundary is estimated to be 36,000 K (35,700 °C; 64,300 °F) and the interior pressure at roughly 3,000–4,500 GPa. Also like Earth, Jupiter’s shape is that of an oblate spheroid. In fact, Jupiter’s polar flattening is greater than that of Earth’s – 0.06487 ± 0.00015 compared to 0.00335. This is due to Jupiter’s rapid rotation on its axis, and is why the planet’s equatorial radius is approximately 4600 km larger than its polar radius. Earth has a very minor orbital eccentricity (approx. 0.0167) and ranges in distance from 147,095,000 km (0.983 AU) from the Sun at perihelion to 151,930,000 km (1.015 AU) at aphelion. This works out to an average distance (aka. semi-major axis) of 149,598,261 km, which is the basis of a single Astronomical Unit (AU). The Earth has an orbital period of 365.25 days, which is the equivalent of 1.000017 Julian years. This means that every four years (in what is known as a Leap Year), the Earth calendar must include an extra day. Though technically a full day is considered to be 24 hours long, our planet takes precisely 23h 56m and 4 s to complete a single sidereal rotation (0.997 Earth days). But combined with its orbital period around the Sun, the time between one sunrise and another (a Solar Day) is 24 hours. Viewed from the celestial north pole, the motion of Earth and its axial rotation appear counterclockwise. From the vantage point above the north poles of both the Sun and Earth, Earth orbits the Sun in a counterclockwise direction. Earth’s axis is tilted also 23.4° towards the ecliptic of the Sun, which is responsible for producing seasonal variations on the planet’s surface. In addition to producing variations in temperature, this also results in variations in the amount of sunlight a hemisphere receives during the course of a year. Meanwhile, Jupiter orbits the Sun at an average distance (semi-major axis) of 778,299,000 km (5.2 AU), ranging from 740,550,000 km (4.95 AU) at perihelion and 816,040,000 km (5.455 AU) at aphelion. At this distance, Jupiter takes 11.8618 Earth years to complete a single orbit of the Sun. In other words, a single Jovian year lasts the equivalent of 4,332.59 Earth days. However, Jupiter’s rotation is the fastest of all the Solar System’s planets, completing a single rotation on its axis in slightly less than ten hours (9 hours, 55 minutes and 30 seconds). Therefore, a single Jovian year lasts 10,475.8 Jovian solar days. Earth’s atmosphere is made up of five main layers – the Troposphere, the Stratosphere, the Mesosphere, the Thermosphere, and the Exosphere. As a rule, air pressure and density decrease the higher one goes into the atmosphere and the farther one is from the surface. However, the relationship between temperature and altitude is more complicated, and may even rise with altitude in some cases. The troposphere contains roughly 80% of the mass of Earth’s atmosphere, with some 50% located in the lower 5.6 km (3.48 mi), making it denser than all its overlying atmospheric layers. It is primarily composed of nitrogen (78%) and oxygen (21%) with trace concentrations of water vapor, carbon dioxide, and other gaseous molecules. Nearly all atmospheric water vapor or moisture is found in the troposphere, so it is the layer where most of Earth’s meteorological phenomena (clouds, rain, snow, lightning storms) take place. The one exception is the Thermoposphere, where the phenomena known as Aurora Borealis and Aurara Australis (aka. The Northern and Southern Lights) are known to take place. 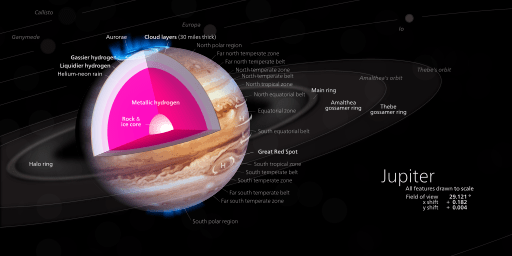 As already noted, Jupiter’s atmosphere is composed primarily of hydrogen and helium, with trace amounts of other elements. Much like Earth, Jupiter experiences auroras near its northern and southern poles. But on Jupiter, the auroral activity is much more intense and rarely ever stops. The intense radiation, Jupiter’s magnetic field, and the abundance of material from Io’s volcanoes that react with Jupiter’s ionosphere create a light show that is truly spectacular. Earth has only one orbiting satellite, The Moon. It’s existence has been known of since prehistoric times, and it has played a major role in the mythological and astronomical traditions of all human cultures and has a significant effect on Earth’s tides. In the modern era, the Moon has continued to serve as a focal point for astronomical and scientific research, as well as space exploration. In fact, the Moon is the only celestial body outside of Earth that humans have actually walked on. The first Moon landing took place on July 20th, 1969, and Neil Armstrong was the first person to set foot on the surface. Since that time, a total of 13 astronauts have been to the Moon, and the research that they carried out has been instrumental in helping us to learn about its composition and formation. The Moon is one of the largest natural satellites in the Solar System and is the second-densest satellite of those whose densities are known (after Jupiter’s satellite Io). It is also tidally locked with Earth, meaning that one side is constantly facing towards us while the other is facing away. The far side, known as the “Dark Side”, remained unknown to humans until probes were sent to photograph it. The Jovian system, on the other hand, has 67 known moons. The four largest are known as the Galilean Moons, which are named after their discoverer, Galileo Galilei. They include: Io, the most volcanically active body in our Solar System; Europa, which is suspected of having a massive subsurface ocean; Ganymede, the largest moon in our Solar System; and Callisto, which is also thought to have a subsurface ocean and features some of the oldest surface material in the Solar System. 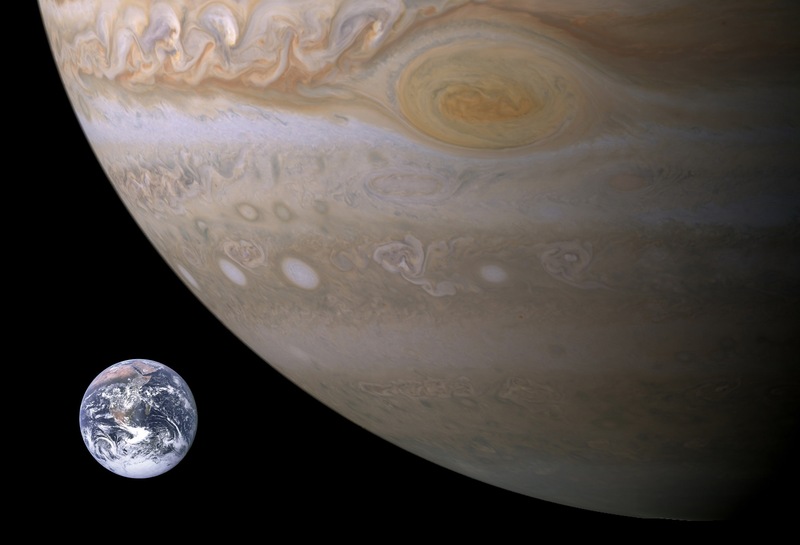 In just about every way imaginable, Earth and Jupiter could not be more different. And there are still many things about the Jovian planet that we do not yet fully understand. Speaking of which, be sure to stay tuned to Universe Today for the latest updates from NASA’s Juno mission. We have written many interesting articles about the planets of the Solar System here at Universe Today. Here’s Earth Compared to Mercury, Earth Compared to Venus, The Moon Compared to Earth, Earth Compared to Mars, Saturn Compared to Earth, and Neptune Compared to Earth. Want more information on Jupiter? Here’s a link to Hubblesite’s News Releases about Jupiter, and here’s NASA’s Solar System Exploration Guide. We have recorded a podcast just about Jupiter for Astronomy Cast. Click here and listen to Episode 56: Jupiter. ‘A total of 13 astronauts have been to the moon’… interesting! I’m trying to figure out how to spell out that throat clearing sound.